Humans whose ancestry includes beings of elemental fire such as efreet, ifrits are a passionate and fickle race. No ifrit is satisfied with a sedentary life; like a wildfire, ifrits must keep moving or burn away into nothingness. Ifrits not only adore flames, but personify multiple aspects of them as well, embodying both fire's dynamic, ever-changing energy and its destructive, pitiless nature. Ifrits vary in appearance as widely as their elemental ancestors do. Most have pointy ears, red or mottled horns on the brow, and hair that flickers and waves as if it were aflame. Some possess skin the color of polished brass or have charcoal-hued scales covering their arms and legs. Ifrits favor revealing and ostentatious clothing in bright oranges and reds, preferably paired with gaudy jewelry. Ifrits are most often born into human communities, and rarely form societies of their own. Those who grow up in a city are almost always imprisoned or driven off before they reach adulthood; most are simply too hot-headed and independent to fit into civilized society, and their predilection toward pyromania doesn't endear them to the local authorities. Those born into nomadic or tribal societies fare much better, since ifrits' instinctive urge to explore and conquer their surroundings can easily earn them a place among their tribe's leadership. Even the best-natured ifrits tend to view other individuals as tools to use as they see fit, and as such they get along best with races they can charm or browbeat into submission. Half-elves and gnomes often find themselves caught up in an ifrit's schemes, while halflings, half-orcs, and dwarves usually bridle at ifrits' controlling nature. Strangely, ifrits sometimes form incredibly close bonds with elves, whose calm, aloof nature seems to counterbalance an ifrit's impulsiveness. Most ifrits refuse to associate with sylphs, but are otherwise on peaceable terms with the other elemental-touched races. Ifrits are a dichotomous people—on one hand, fiercely independent, and on the other, imperious and demanding. They are often accused of being morally impoverished, but their troublemaking behavior is rarely motivated by true malice. Ifrits are usually lawful neutral or chaotic neutral, with a few falling into true neutrality. Most ifrits lack the mindset to follow a god's teachings, and resent the strictures placed on them by organized faith. When ifrits do take to worship (usually venerating a fire-related deity), they prove to be zealous and devoted followers. Ifrits adventure for the sheer thrill of it and for the chance to test their skill against worthy foes, but most of all they adventure in search of power. Once ifrits dedicate themselves to a task, they pursue it unflinchingly, never stopping to consider the dangers ahead of them. When this brashness finally catches up with them, ifrits often rely on sorcery or bardic magic to combat their resulting troubles. +2 Dexterity, +2 Charisma, -2 Wisdom: Ifrits are passionate and quick, but impetuous and destructive. Native Outsider: Ifrits are outsiders with the native subtype. Medium: Ifrits are Medium creatures and receive no bonuses or penalties due to their size. Normal Speed: Ifrits have a base speed of 30 feet. Darkvision: Ifrits can see in the dark up to 60 feet. Skill Bonus: Ifrits receive a +2 racial bonus on Acrobatics and Intimidate skill checks. Spell-Like Ability: Burning hands 1/day (caster level equals the ifrit's level). Energy Resistance: Ifrits have fire resistance 5. Fire Affinity: Ifrit sorcerers with the elemental (fire) bloodline treat their Charisma score as 2 points higher for all sorcerer spells and class abilities. Ifrit spellcasters with the Fire domain use their domain powers and spells at +1 caster level. Elemental Assault: Ifrits gain the following supernatural ability: Once per day as a swift action, an Ifrit can call on the elemental power lurking in its veins to shroud its arms in fire. Unarmed strikes with its elbows or hands (or attacks with weapons held in those hands) deal +1d6 points of fire damage. This lasts for 1 round per character level. The Ifrit may end the effects of its elemental assault early as a free action. Relentless: Ifrits gain a +2 bonus on combat maneuver checks made to bull rush or overrun an opponent. This bonus only applies while both the Ifrit and its opponent are standing on the ground. Fleet-Footed: Ifrits receive Run as a bonus feat and a +2 racial bonus on initiative checks. Languages: Ifrits begin play speaking Common and Ignan. Ifrits with high Intelligence scores can choose from the following: Aquan, Auran, Dwarven, Elven, Gnome, Halfling, and Terran. Desert Mirage: Ifrits thrive in the deserts of the world, where their keen instincts and resistance to heat give them a huge edge over their competitors. Those with this trait gain a +2 racial bonus on Stealth checks in desert environments and on saves to resist starvation and thirst. This racial trait replaces fire affinity. Efreeti Magic: Some ifrits inherit an efreeti ancestor's ability to magically change a creature's size. They can cast either enlarge person or reduce person (the ifrit chooses when using this ability) once per day as a spell-like ability (caster level equals the ifrit's level). The ifrit can use this ability to affect other ifrits as though they were humanoid creatures. This racial trait replaces the spell-like ability racial trait. Fire in the Blood: Ifrits with this racial trait mimic the healing abilities of the mephits, gaining fast healing 2 for 1 round anytime they take fire damage (whether or not this fire damage gets through their fire resistance). The ifrits can heal up to 2 hit points per level per day with this ability, after which it ceases to function. This racial trait replaces fire affinity. 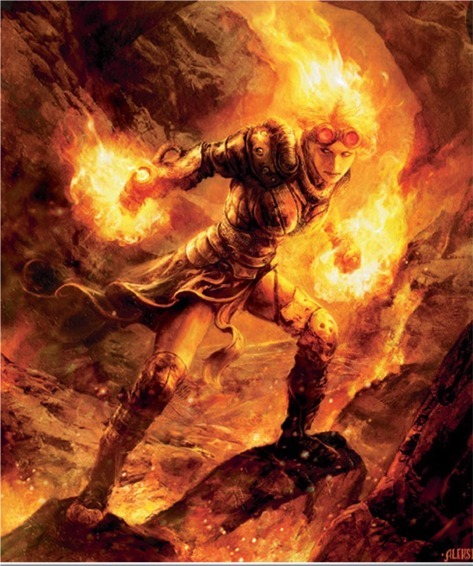 Fire Insight: Ifrit spellcasters sometimes find that their elemental heritage makes creatures of fire more willing to serve them. Summon monster and summon nature's ally spells that the ifrit casts last 2 rounds longer than normal when used to summon creatures with the fire subtype. This racial trait replaces fire affinity. Fire-Starter: Ifrits with this racial trait derive sadistic satisfaction from watching others burn. Anytime the ifrit causes a creature to catch fire, he gains a +1 morale bonus on the next single attack roll, saving throw, skill check, or ability check that he makes in the next round. The ifrit only gains this bonus the first time he causes a particular creature to catch fire; subsequent times the creature catches fire provide no bonus. This racial trait replaces fire affinity. Forge-Hardened: Not all ifrits are descended from efreet—some instead descend from azers or even salamanders. Such ifrits gain a +2 racial bonus on Craft (armor and weapons) checks and saves to resist fatigue and exhaustion. This racial trait replaces the spell-like ability racial trait. Hypnotic: Ifrits with this racial trait evoke the entrancing nature of flame, adding +1 to the DC for all saving throws against spells or effects they cast that inflict the fascinated condition. Once per day, when a creature rolls a saving throw against such an effect from the ifrit, the ifrit can spend an immediate action to force that creature to reroll the saving throw and use the second result, even if it is worse. The ifrit must announce he is using this ability before the results of the first roll are revealed. This racial trait replaces fire affinity. Wildfire Heart: Ifrits with this trait are as swift and dangerous as a blazing wildfire. They gain a +4 racial bonus on initiative checks. This racial trait replaces energy resistance. Alchemist: Add +1/2 to the alchemist's bomb damage. Bard: Add +1/6 to the number of people the bard can affect with the fascinate bardic performance. Cleric: Add a +1/2 bonus on Knowledge (planes) checks relating to the Plane of Fire and creatures with the fire subtype. Gunslinger: Add +1/2 to the bonus on initiative checks the gunslinger makes while using her gunslinger initiative deed. Inquisitor: Add a +1/2 bonus on Intimidate checks made against creatures with the fire subtype and a +1/2 bonus on Knowledge (planes) checks relating to the Plane of Fire. Oracle: Add +1/2 to the oracle's level for the purpose of determining the effects of one revelation. Rogue: Add a +1/2 bonus on Acrobatics checks to jump and a +1/2 bonus on Intimidate checks to demoralize enemies. Sorcerer: Choose a bloodline power from the elemental (fire) bloodline or the efreeti bloodline that the sorcerer can use. The sorcerer treats her class level as though it were +1/2 higher (to a maximum of +4) when determining the effects of that power.